If you want a real taste of beautiful scenery, village life, chocolate-box-pretty towns, and the occasional dead body, I've got just the thing for you! 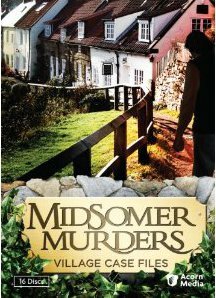 Acorn Media is releasing a collection of recent DVDs in the Midsomer Murders Village Case Files. If you've never visited the lovely English county of Midsomer, you're in for a treat! Nestled in the middle of England (the real filming takes place in villages in Buckinghamshire and Oxfordshire), the events portrayed in Midsomer Murders take place in towns with charming names like Midsomer Mallow, Midsomer Wellow, Badgers Drift and Morton Fendle. It's up to the dogged DCI Tom Barnaby (played by John Nettles) and his assistants DS Dan Scott and DC Ben Jones to clear up the many cases of murder that inexplicably happen in such gorgeous surroundings. In every episode we are also treated to scenes from DCI Barnaby's home life, including his long-suffering wife Joyce (very sweet, but decidedly lacking in culinary skills) and daughter Cully (an aspiring actress). The play between Barnaby and his underlings is also interesting to watch. Somehow the assistants are always the ones directed to chase and tackle fleeing suspects or to overnight in barns and lofts to await developments. The episodes generally start with the victim meeting his untimely end, and Barnaby and sidekick rushing to the scene. There will likely be more bodies piled up before the evildoer is finally tracked down! Many of the mysteries are set in specialized worlds. The people involved (victims and suspects) might be involved in the local horse racing scene, or be collectors of rare orchids or all have psychic powers. Everyone is a suspect (well, until he or she turns up dead, that is!) and it's fun to see if I can suss out the murderer before Barnaby does (generally not!). The series began in 1997 in the UK and since then more than 65 feature-length episodes have aired. 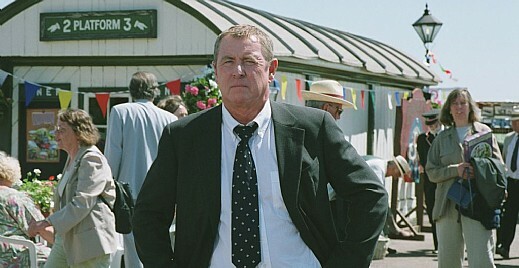 The series is still in production, although John Nettles is set to retire from the show this year). The Village Case Files set contains 4 sets of DVDs containing 16 mysteries. The scenery is lovely. There are plenty of thatched cottages, flowers, stately churches and village fetes to whet the appetite for a quick visit to this lovely area of England! Bonus features include text interviews with John Nettles and Jason Hughes, fascinating facts, The Killings of Badger's Drift connection, production notes, Caroline Graham (who wrote the novels that inspired the series) biography and cast filmographies. Thanks to Alyssa at Acorn Media, I have one copy of Midsomer Murders Village Case Files to giveaway! To enter, just leave a comment stating a mystery you would recommend. It can be a book or a TV series or even a film. Make sure your email address is in your comment or profile (if you have a blog) so that I can contact you. Open only to the U.S. Enter by Oct. 20. Final Verdict for Midsomer Murders Village Case Files: Five Gherkins, for being a cosy look at an idyllic British countryside . . . if you can overlook all the dead bodies! Not sure if they count as mysteries, but the TV show Without A Trace is very good. It's about the FBI finding missing people that disappear without a trace. When I lived in Scotland Midsomer Murders was my favorite mystery program. Have been hoping that PBS Materypiece Mysteries would add this series. As for American mysteries my favorite is Bones. The characters are wonderful and the players have everh role down pat. Love, Love, Love Midsomer Murders - our favourite by far! Barnaby is the best. I think we've exhausted all episodes available in the local library at this point! OK, forgot to recommend a mystery - well, we are also partial to Inspector Lynley, Foyles War and of course, Morse! I loved the classic "Woman in White" by Wilkie Collins. It was so atmospheric I actually became terrified at the simple appearance of the woman in white, just reading it. I grew up in France, have been living in the US for 15 years, but I'll always have a soft spot and preference for British culture. You can't beat Agatha Christie's mysteries-TV shows, movies or books-she was the master. I recommend reading everything by Agatha Christie except her bio. Oh, these are regularly in my Netflix queue. I also recommend the Inspector Lynley series by Elizabeth George. I really enjoy the Inspector Lewis series on PBS Mystery. My all-time favorite murder mystery is the 1974 adaptation of Agatha Christie's "Murder on the Orient Express". Wonderful movie. I would say sherlock holmes. The programme, although very nice, should retire along with John Nettles. I thought series 1 was amazing but unfortunately as time has gone on, the programme has become less believable. Taggart from Glasgow gets my vote as something edging towards the real world with dry humour. I'm a fan of the David Suchet's take on Agatha Christie's Poirot mysteries. The Columbo mysteries are my favorite. Even though the murderer is usually revealed in the first scene, it's so fun to watch Columbo at work! I recommend the book Still Life by Louise Penney. Thanks for the opportunity to win, we love the Midsomer Murders series! One mystery movie I would recommend is North By Northwest. Hitchcock was a brilliant director and this is one of my favorites. Thank you for the great give-away. I love J.A. Jance's series with the widowed sheriff in Arizona! Can't remember the exact name of the series, but whenever I find one of her books, I eat it up! And my mom raves about the Midsomer Murders Series! I would suggest anything with Poirot. I love his smarmy little disposition. I adore The Horse You Came In On by Martha Grimes (who writes really good British mysteries even though she's American-- a girl after my own heart!). I always refer friends to the mystery series of books by Julia Spencer Fleming. "Prime Suspect" with Helen Mirren! I'm crazy about Dorothy Cannell's Ellie Haskell series of mystery novels. They're so entertaining, and very British, too! All the PBS mysteries are excellent, but Inspector Linley is my favorite. Prime Suspect was my absolute all time favorite. I watched every one of them! I would recommend the Peter Robinson Alan Banks mysteries. They are superb. Sherlock Holmes mysteries have always been my favorite. I love the classic, but I like alot of these new ones also. I liked to TV series Alfred Hitchcock Presents, which included many riveting mysteries. I love police procedurals-not sure if they qualify as mysteries-but I highly recommend Michael Connelly's books-his newests is "The Reversal". Thanks! I'd recommend something off the usual track..."The Curious Case of the Dog in the Night Time". It's a mystery as told through the eyes of an autistic child. It was such an interesting book to read. Thanks. I recommend Midnight Caller the series. Monk is a good mystery TV series. I would say the classic Agatha Christie! I've never seen "Midsomer Murders" but other UK mysteries I've enjoyed are "Inspector Lewis" and "Cadfael." I love "Law and Order" and "L&O:SVU" on this side of the pond. I'd recommend any of the Miss Marple Agatha Christie books. They may be old but they're still great.